Delaware Arts Info: Dinotopia is Dinotastic! 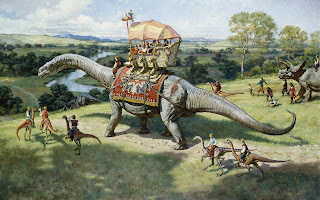 Picture at right: The Excursion, from Dinotopia: The World Beneath. James Gurney (born 1958). Oil on board mounted to plywood, 28 x 42 inches. Collection of the artist. © 1995 James Gurney. All rights reserved. Not so at the Delaware Art Museum’s newest exhibit, Dinotopia: The Fantastical Art of James Gurney, on view now through May 16. Gurney’s drawings from his Dinotopia book series tell the tale of explorer Arthur Denison and his son, who stumble upon a world where dinos and humans dwell peacefully together: A stunning, color- and texture-rich depiction of a culturally integrated, socially responsible, incredible utopia. The concept as a whole truly spoke to me, with a powerful message easily translatable in today’s world. Gurney’s stories are equally appealing to children and adults, and feature an artistically and architecturally rich land, varying in ethnic groups (and species) and historical eras---all living in harmony. Each piece exhibits amazing details in color and shadow; the dinos’ bodies are stippled with texture and striking hues. Gurney’s influence from both the pre-Raphaelites and artist Howard Pyle is strongly evident. Gurney uses many fascinating techniques in his work: Rembrandt’s “dark against light, light against dark”, to draw the eye’s focus and provide three-dimensional depth to his work; and a technique he calls “spokewheeling”, in which he employs the use of lines to direct the viewer’s eye to a particular area of the piece, as in the piece Stormy Sea. Gurney intended his works to both stand alone and tell the story, and as such, the exhibit includes several intriguing additions, such as a “photograph” of Arthur Denison and his son, as well as a model of their expedition “journal”. A few of my favorite pieces: Up High, a vivid portrayal of resident children riding on the backs of Brachiosaurs in celebration of their “hatchdays”; Waterfall City, an expansive piece showing the “great learning center” of Dinotopia; and Clean Teeth, a whimsical drawing, highlighting some “everyday activity” in the world of human and dino. There’s no better reason to head to the Delaware Art Museum with your children, nieces, nephews, or simply solo…This exhibit will make you gasp, smile, giggle and contemplate the implausible: A peaceful coexistence between seemingly improbable worlds. Gurney will be on hand at the museum on Sunday, February 7, with a lecture at 2pm and a book signing at 4pm. He is also slated to present demonstrations for six regional schools at the museum next week; hopefully, your child’s is on the list! BONUS: On my way out, I ran into guest curator Judith Schwab, who is putting together the Outlooks exhibit, Women Collared for Work, which will open (hopefully) for this Friday’s Art on the Town. Back from 5 years in Florida, Schwab (who turns 75 this month) has lovingly constructed this exhibit, with folk-art flair and a broad range of media, with a very personal touch. “I wanted to create a show that puts everything in my life together through art,” Schwab noted. And what better way to do that than look to those she admires---her artist friends. “All the women in this show have work that has impacted mine,” she says. Brave the weather and see this exhibit, on view through March 21. It's Kids' Stuff....with the Arts!